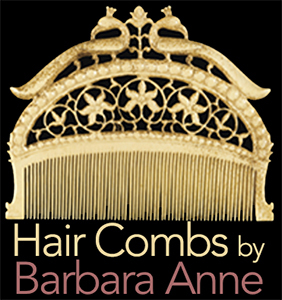 Every culture has a comb. 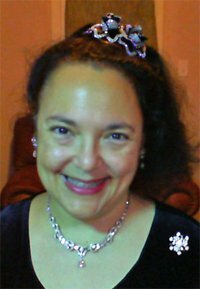 It can symbolize a ruler’s deification, be a liturgical object for high priests, or an item that pushes the limits of an artistic movement. 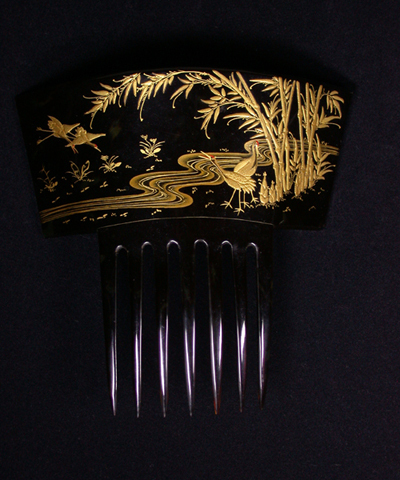 In Japanese culture, combs were an expression of love. 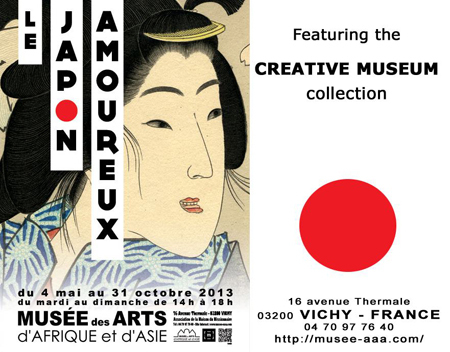 On May 4, The Creative Museum steps into the real world again by contributing items from their Japanese collection to an exhibition at the Musée d’arts d’Afrique et d’Asie called Le Japon Amoureux. 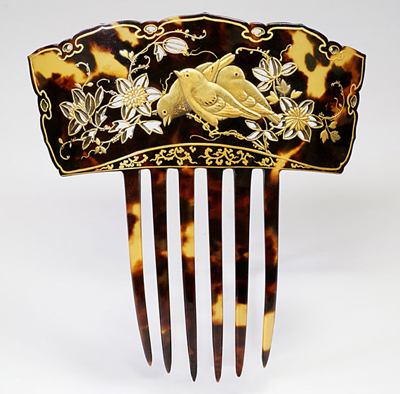 Their combs will accentuate the Musée’s own collection of Japanese prints. Having gained recognition by a second museum after En Tête à Tête at Le Musée des Beaux-Arts d’Angoulême, The Creative Museum’s collection is becoming a source for museums around the world. I am eagerly anticipating their multimedia presentation about Le Japon Amoureux. 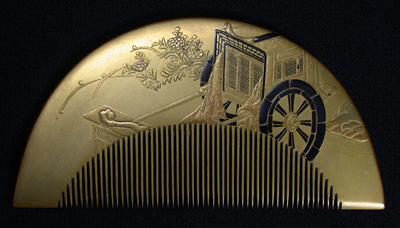 For now, I will just pick a few of my favorite Japanese combs. This is a full modern wedding set of turquoise silk with colorful beads. 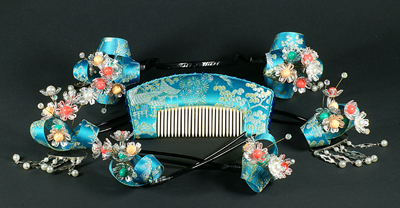 It is composed of a kushi, two pairs of kanzashi and a bar placed in the bun. 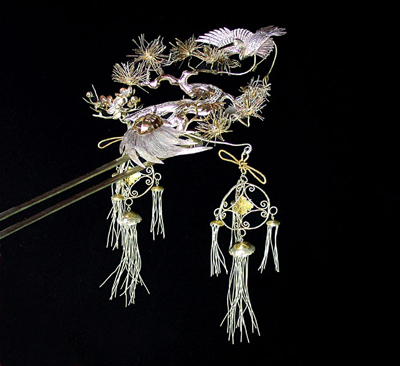 This silver kanzashi celebrates a popular Japanese wedding concept: the crane for happiness and faithfulness; Minogame, a sea turtle so old, seaweed gets stuck to his tail. He symbolizes endurance and longevity; and pine branches and cherry blossoms for renewal. 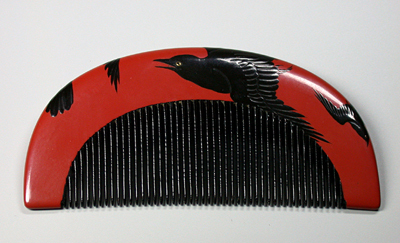 This red cinnebar lacquer comb is decorated with ravens. These two combs were made for Western clients. The first is carved in a beautiful cherry. Cranes and bamboo are painted in gold. The second is made of shell with gold sparrows. 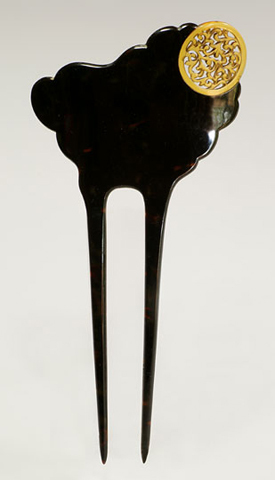 An Edo lacquered wood and gilt embossed comb with Takamaki-e (a technique where the lacquer is polished down to show the gold paint in high relief) shows a palanquin highlighted in black. A moon of pierced blond tortoiseshell appears behind a dark cloud. Taisho (1912-1926). I think this shows how the Art Deco movement influenced Japanese artists. I have left out some splendid pieces. To see those in the context of the exhibition, you can wait for the slide show or examine The Creative Museum’s entire Japanese collection. For more scholarly research, please examine the publications of The Creative Museum.